Smartphones are ubiquitous, and it seems that many people have begun treating phones as disposable items. This is incredible when we think about how much non-renewable materials go into the creation of smartphones and how much energy is required to build them. A chief culprit in our war against a wasteful society, smartphones must be recycled through ethical recycling companies like All Green Electronics Recycling. As leaders in smartphone recycling, we ensure that smartphones are repurposed or recycled, and not simply thrown away wastefully in a landfill. Old equipment will inevitably require replacement but that does not mean it’s not still valuable. From these older phones, either functional parts can be disassembled and utilized for other purposes or materials can be harvested for scrap metal. We understand the market for these components and can guide you towards the best choice. Rather than simply disposing of your old equipment, put our expertise at your disposal and you’ll be helping both the environment and your bottom line. We understand that you have a business to run and do our utmost to minimize the disruption of equipment removal. Our trucks will be dispatched to your facility according to your schedule such that the equipment replacement process is as minimally disruptive as possible. Our moving services can also safely prepare the equipment for transport with a thorough labeling process that allows you to monitor progress through our online logistics dashboard. We’re willing to go the extra mile for your convenience. High technology smartphones contain a wealth of corporate data stored in memory components such as hard drives and random access memory. This data could be damaging if it wound up in the wrong hands. Rather than take unnecessary chances with your data, entrust disposal of your equipment to an industry leader. With an ISO 14001 compliant tracking system for your equipment, you can rest assured your private corporate information will be protected. Environmental compliance is of paramount importance in today’s economy. Indeed, both the health of the planet and your professional reputation are at stake; hire a firm that understands the importance of getting equipment disposal right. Our entire corporate mission is built upon the concept of sustainability and we can guarantee that every piece of equipment we process is handled responsibly. By entrusting your smartphone disposal and recycling to us, you minimize the byproducts of industrial waste, promote a healthy planet, and protect yourself from the risk of environmental impact fines. The Environmental Protection Agency estimates that the U.S. generates nearly 5 million tons of electronic waste annually. It is currently estimated that only about 10-12% of smartphones are being recycled. Worldwide, the number is even lower, hovering at around 8-9%. Americans replace their smartphones with newer models to the tune of 130 million a year, with smartphones having an average life expectancy of just 18 months. When upgrading to a new smartphone, you have a decision to make about what to do with your old phone. Recycling offers a practical and environmentally-conscious choice, compared to merely leaving it sitting in a drawer or disposing of it in a landfill. For every one million cell phones recycled, the Environmental Protection Agency estimates a significant amount of recoverable precious non-renewable resources, including 35,000 pounds of copper, 772 pounds of silver, 75 pounds of gold, and 33 pounds of palladium. Steel, nickel, glass and plastic materials are valuable and may also be reclaimed either whole, or can be melted down to be used in the building of other products. Some estimates show that 500 million smartphones are currently sitting around unused in people’s homes. Others put this number at closer to a billion. Toxic chemicals from smartphones left in landfills include barium, lead, mercury, lithium and rhodium to name a few. These chemicals pollute the air, ground, groundwater, and rivers, lakes and streams through run-off and create a potential for a variety of serious health effects, including cancer, birth defects, and damage to all major organ systems. Furthermore, wildlife populations are endangered through contamination, erosion, and loss of vegetation. Recycling offers a safe option which protects health, preserves the planet, and guards our limited supply of precious resources. 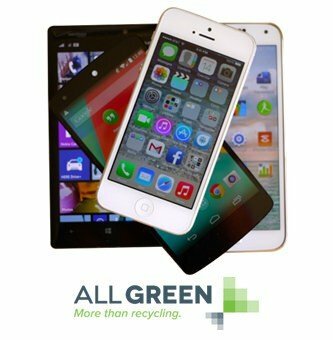 When choosing to recycle a smartphone, we offer consumers convenient options. You can drop off your old smartphone at any of our conveniently located pick-up sites, or we can arrange to pick it up at a time that is convenient for you. We provide an online management system that allows you to track the progress of your recycled smartphone through every step of the process. We appreciate that smartphones often contain sensitive data, and we value our customer’s privacy and are committed to the highest standards of ethics and integrity. Any smartphone with existing data will be wiped clean using our state-of-the-art equipment. While many recyclers simply ship electronic waste to landfills in third world countries, we’re truly committed to protecting everyone’s environment, so smartphones which can be repaired or reused will be salvaged. Any smartphones with cannot be repaired or reused will be responsibly recycled for their precious materials and other reusable materials. 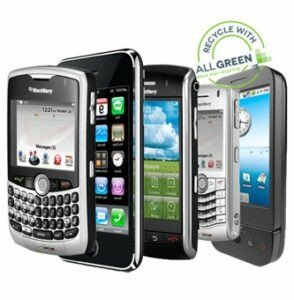 Consumers may even be eligible to receive payment when choosing to recycle smartphones. We strive to offer consumers simplicity and a choice they can feel good about. We want All Green Electronics Recycling to be your recycler of choice.